After many hours of tramping around Soho and the surrounding area, I have finally managed to locate all the "Seven Noses of Soho". This could be a life-changing event for me, as the legend has it that anyone able to see all the Seven Noses of Soho will "attain infinite wealth". Obsessive checking of my bank balance suggests that whilst the legend may be true, the effect is certainly not instantaneous. 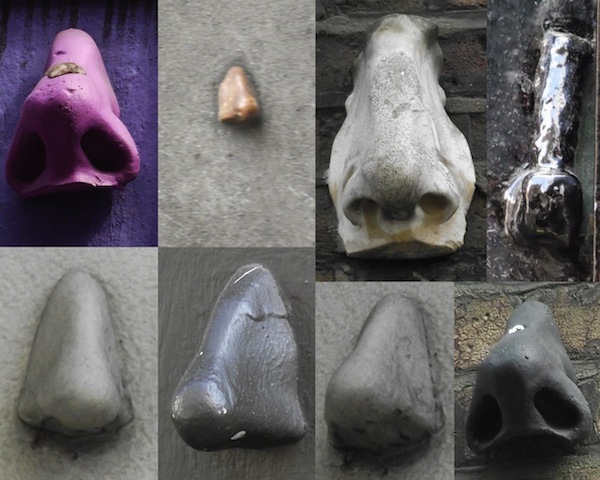 Until this year I had never heard of the Seven Noses of Soho. As I discovered more of them, spoke to other observers, followed tip-offs and read more about them I became mildly obsessed with seeing them all and separating fact from fiction.. It all started in 1996, when a sculptor, Rick Buckley decorated several London buildings, mostly in Soho, with casts of his nose.The noses are still there, they have their own Facebook group, a film-maker made a short documentary about them and an awful lot of misleading information about them can be found on the net! Locating all of them has taken quite some time. In addition to the Seven Noses, there is also an eighth nose-like object "The False Nose" and strong rumours of a mysterious ninth, "The Ghost Nose". If you would like to see them all yourself and learn more about this intriguing bit of London folklore, I offer walking tours and can help you find them too.